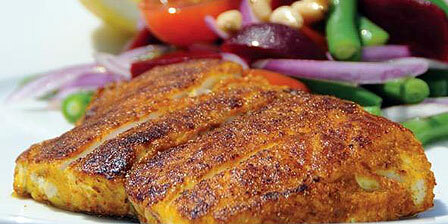 Saltwater Barramundi (Lates calcarifer) is one of the world’s great eating fish. It’s a unique Australian delicacy offering firm, succulent flesh and a delicate combination of flavours and aromas. The Barramundi belongs to the perch family of fish. Its name ‘Barramundi’ is believed to have Aboriginal origins and means ‘fish with big scales’. For more information on this, please visit the Australian Barramundi Farmers Association website. Prized for its eating qualities, Barramundi has been in demand for many years. So, with a view to establish sustainable supply for this admirable fighting fish, the Australian Farmed Barramundi Industry started in the mid 1980s. Today, it consists of around 100 licensed farmers operating in all states, except Tasmania. Daintree Saltwater Barramundi Fish Farms started in 2002, to provide a sustainable supply of premium quality Australian Barramundi. Our saltwater-reared Barramundi has won multiple awards at the Sydney Fine Food Show since first competing in 2006, and has passed the stringent requirements for EU export and Safe Food Queensland certification. We achieve this high quality by growing our fish in pristine salt water, which has been sourced from the Daintree River. 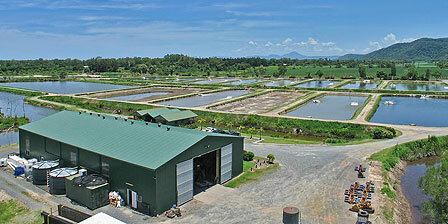 Our Barramundi is reared under free range conditions, in large earthen ponds. Fingerlings are carefully selected from local hatcheries, to ensure only the highest quality stocks are on-grown. Daintree Saltwater Barramundi Fish Farms rear our fish using industry best practice, husbandry techniques, in accordance with strict environmental management guidelines. This ensures we provide optimum growing conditions for our fish, whilst maintaining the delicate balance of our farm’s natural surroundings. Barramundi is good for you and a recommended part of everyone’s diet. Farmed Barramundi has naturally high levels of many nutrients which contribute to a healthy lifestyle. It is a good source of Omega 3, which contains anti-inflammatory properties which can reduce the risk of heart disease and arthritis symptoms. It’s also a source of phosphorus, which helps to protect the blood’s acid/base balance, and selenium which is an anti-oxidant which assists in maintaining thyroid health and the body’s immune system. Did you know that 100 grams of Farmed Barramundi equals the same Omega 3 as 1,700 grams of Scotch Fillet Steak? For more information, please visit Super Seafood. Barramundi is easy to cook and for your eating pleasure, we have provided some recipes on this website. So, not only is Barramundi good for you, but by choosing Australian farmed Barramundi you are selecting a sustainable solution which is good for you and the environment.